Monument Square Music is getting a make over! 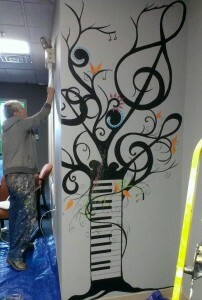 We are lucky to have the talented artist Emily Ashman painting the music school, bringing lots of life and color to the place! Our new look is almost complete and the students are very excited about the colorful rooms and cool, musical murals on the walls. Emily is a multi-talented artist who also excels at photography and graphic design. 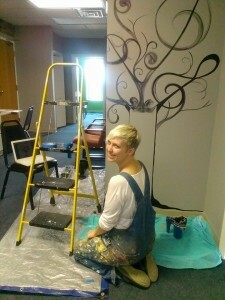 You can check out her work at http://theillustratedroom.com/ She also holds paint parties at different venues in the area. 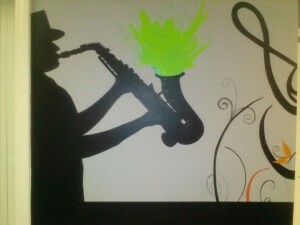 Check out the dates for these fun events at http://www.wepaintsocial.com/social-calendar/ In the meantime we are very excited to watch this art in progress. Looking good…. thanks Emily!